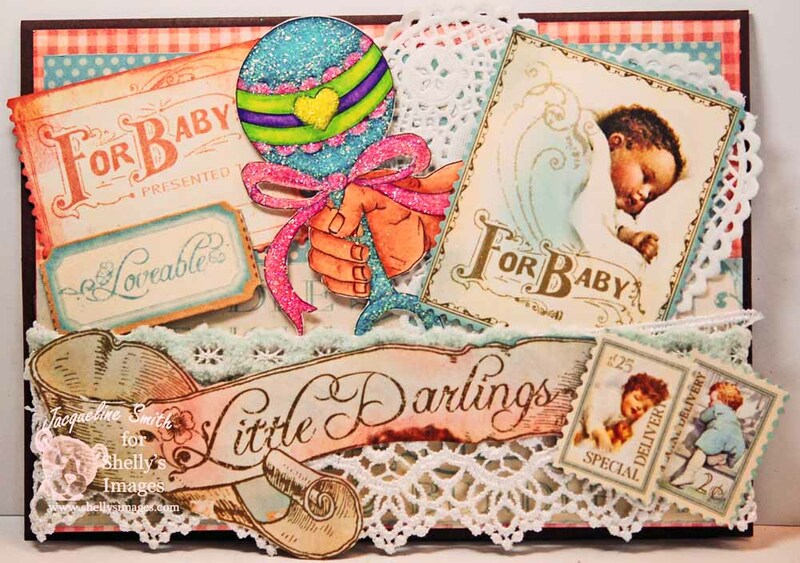 Stamping4you: Shelly's Images - TTT Challenge Theme - Oh Scrap!!!! Use your scraps on your projects. Shelly's Images - TTT Challenge Theme - Oh Scrap!!!! Use your scraps on your projects. The monthly challenge for the month of August is "Oh Scrap" to use scraps on your project. I used scraps of ribbon that I had left over from previous projects. I started off using Early Espresso for my base which is a 5"x 7" finished card size. I then used Graphic 45 'Little Darlings' for the rest. I added 3 layers of paper before placing down a white heart doily and then adding scraps of white lace and then use a blue crocheted lace on top. I then use sheet of paper that had all these cute babies on it which I cut out using my postage scissors to add a decorative edge around the images. I also cut out the 'Little Darlings' banner as well as the sign the says 'For Baby' from the same paper collection. I then printed the rattle image (which came with 3 different ones) onto shimmery white paper and colored the rattle using Prismacolor pencils except for the hand which I colored using my Copic Markers (E01, E11 & E13). I then added some glitter from Sparkle N Sprinkle. Gorgeous Jackie, loving the doilies and the lace. Fabulous baby card, love the vintage feel with thelaceandimages.